Recently, we had the good fortune to meet horseman and American Quarter Horse Association show judge, Bill Enk & his wife, Colleen, who have a passion for Vizsla dogs. 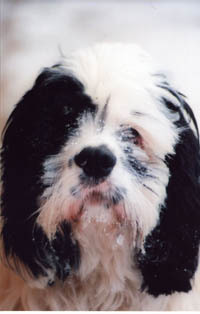 Bill told us that the breed originated in Hungary, where they are valued sporting dogs and family companions. They’re smart, sensitive and extremely loyal. Bill also appreciates that Vizslas don’t chase horses, which is a necessity on a ranch. “But,” he adds, “they’re fearless and really bond with their people.” And–Cooper reminds us– “…he says they’re sometimes called ‘Velcro dogs’ cause they stick with you! Good Dogs, those Vizslas!” Bill and Colleen are pictured here with Mabel, the fourth Vizsla to join their family. Bill’s one busy cowboy, serving on AQHA’s judges committee and working as director of judges for the National Reined Cowhorse Association, as well as judging for several other associations, including the NRHA, NSBA and and NCHA. He’s spent his life working in the horse business–something he really loves–and his integrity and passion for horses inspire us, too. To read more about Bill, check out the Quarter Chat feature in November’s issue of the AQHA Journal –that’s one great mag! Thanks to Janet E. Rossi Photography for the great pix!